When I inquired about the Hornet at Aeromicro, Perry (the owner, who also knows everything about electric planes) suggested that a Crazy Max might be what I was after. 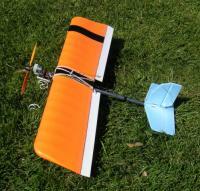 But after our experience with the Blue Max, I was leery of Wattage planes with that flimsy triangular fuselage. It's just bad design. 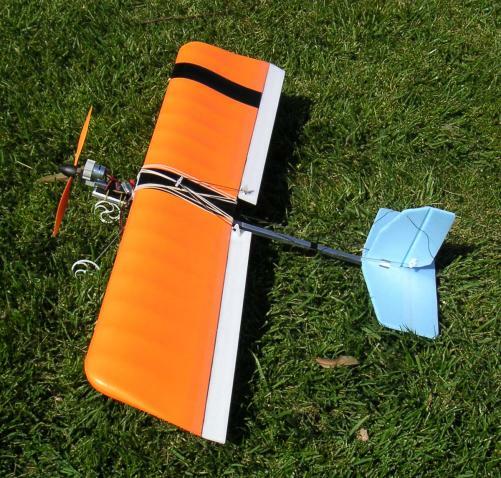 But then after I got the idea of fitting the Blue Max wing to a Slow Stick stick, and that worked well, and Dave discovered that it's possible to buy a Crazy Max wing without the rest of the kit ... well, how could I resist? The only tricky part about this is how to fit the thick, flat Crazy Max wings onto a Slow Stick saddle that's expecting a wing with dihedral and a very high incidence. The front wing mount on the Slow Stick is very much higher than the rear mount; and the Crazy Max wing is very thick in front, thinner in the rear, while the SS wing is flat except for the dihedral. The solution: reverse the mounts! I put the high mount in the rear, the low mount in the front; then I added some padding made from scrap foam on the front mount, cut at an angle to match the front of the Crazy Max wing. Voila! Then I needed a tail. Balsa seemed like the right solution. But I didn't have any balsa, and I felt like making something that evening, and I had a bunch of Bluecore foam in the garage left over from my foamie biplane project ... and that blue foam is so easy to work with that I just threw together a tail to see what would happen. Since it was just a temporary tail, I taped it to the stick rather than glueing it. Dave was mortified -- it's so ugly he doesn't want to look at it and says he'd be embarassed to fly such a plane. My Hornet was already flying by the time I started this project ... I didn't really need another aerobatic plane, so this was just for fun. But halfway through the project, the Hornet met a tragic end when a high-speed jet flew through its wing. Suddenly my motivation level increased dramatically, and I finished throwing together the Crazy Stick, using tape and flimsy wire gear (takes too long to bend thick wire) and anything else I could find. Final flying weight is 11 oz -- under the weight of the first Hornet, about the same as Hornet II, with the same engine (a GWS 350C with 9x7 prop) and battery (1300 li-po). The Crazy Stick fairly leapt out of my hand into the sky. I had low expectations, for a plane thrown together for about $20 in spare parts plus an engine I already had lying around. The funny thing is: it flies great! It's somewhat similar in character to my beloved Hornet: very precise, relatively low roll rates, symmetrical wing for good inverted flight (though it takes more down stick to keep it flying inverted than the Hornet needed ... maybe because it's a high wing? ), slow but impressive snap rolls. It flies a bit faster than the Hornet (probably because the wing is a little thinner) but it's somewhat more sensitive to wind; but overall it's remarkably similar, and it kept me happy after the Hornet was destroyed in a midair collision and until I got Hornet II into the air. Since it was much cheaper and easier to build than the Hornet, it's really an excellent choice for someone looking for a mid-sized, relatively slow-flying aerobat.